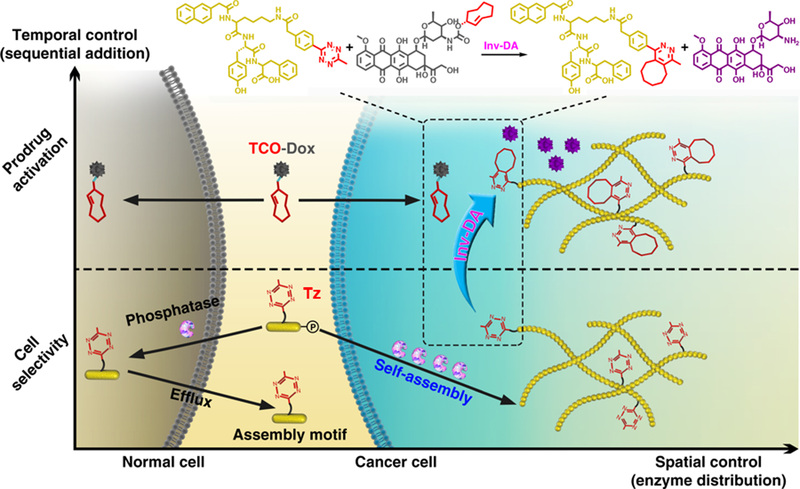 A small molecule-based cancer therapy was developed by synergizing the enzyme instructed supramolecular assembly (EISA) and bioorthogonal cleavage reaction to unleash an anti-cancer drug on demand. Adverse drug reactions (ADRs) on normal cell populations and critical organs severely limited the applicable dosage of many anticancer drugs, which may ultimately result in cancer recurrence and metastasis. Here we coupled the enzyme instructed supramolecular assembly (EISA) with the tetrazine / trans-cyclooctene (TCO)-based bioorthogonal cleavage reaction to selectively activate a prodrug within cancer cells, achieving the urgently desired tumor selectivity for chemotherapy (Figure 1). Given the over-expressing phosphatase in cervical cancer cells, we designed a bifunctional molecule composed of a phosphatase responsive assembly precursor and a bioorthogonal cleavage trigger-tetrazine (Tz). The phosphatase triggered EISA can selectively occur inside cancer cells to achieve cancer-specific accumulation of Tz, which can subsequently trigger the rescue of the TCO-caged doxorubicin prodrug (TCO-Dox) via an inverse electron demand Diels-Alder reaction. TCO-Dox showed little toxicity against normal cells, enhancing the selectivity of this bioorthogonal activate-able prodrug by 1-2 orders of magnitude as that of native Dox. This new prodrug activation strategy exhibited high tumour inhibition efficacy with satisfactory biocompatibility, pharmacokinetics, and safety with an in vivo setting. Overall, the synergistic enzymatic and bioorthogonal reactions enabled spatiotemporal-controlled prodrug activation with superior selectivity towards cancer cells over normal cells. This work opens a new appealing avenue for ADR reduction in chemotherapy, which may achieve safe and sustained tumor inhibition. Noteworthy, the bioorthogonal TCO-caging method is readily applicable to various functional moieties to generate cleavable TCO carbamates, esters, carbonates, or even ethers. The versatility of this chemical caging strategy could be adapted to a vast range of cytotoxic compounds, expanding the scope of anticancer therapeutic agents. Meanwhile, the subcellular-localized feature of our EISA-triggered self-assembly (e.g., near microtubules) could be leveraged to bring certain toxins (e.g., maytansine) in close proximity to the corresponding cellular targets with further enhanced therapeutic efficacy. We envision that integration of enzymatic and bioorthogonal reactions will serve as a general small-molecule-based, intracellular-targeted chemotherapy with significantly alleviated ADRs. The study, published in Nature Communications (Nat. Commun., 2018, 9, 5032), can be downloaded from the link below.